Home » Daniel , How to Succeed in Business Without Really Trying » USA Today: Daniel Radcliffe on "How to Succeed"
A new interview by USA Today, where he discussed his new turn in How to Succeed in Business Without Really Trying, and briefly commented on finishing Harry Potter and The Woman in Black. With thanks to @ThomasFeltonUK for letting me know about the great picture of Dan in the Al Hirschfeld Theatre. 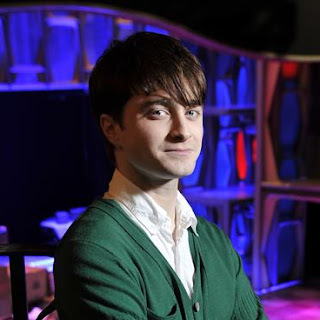 "I just moved into the world of Xbox Live," Radcliffe says in the lobby of the Al Hirschfeld Theatre, where How to Succeed is in previews for an opening March 27. "And I've discovered that everyone on the Internet is a lot better than me. I spent half an hour the other day designing a boxer, and I got knocked out twice in the first round." "The show is set not only in New York before 9/11 but in America before JFK was assassinated. There was no fear, and no shame in wanting to rise to the top. It's thrilling to be able to remind an audience of that." The actor had always liked show tunes: "My parents were what I like to call proper musical fans. Lots of Sondheim was played in the car," in addition to the scores of South Pacific and another Loesser classic, Guys and Dolls. But the prospect of dancing "scared me. A lot. Because I have absolutely no aptitude for it." "It was a matter of putting in the time so I could develop the confidence," Radcliffe says. "My dance teacher keeps telling me, 'If you're smiling, your feet could be doing pretty much anything and no one will care.' But if you have that rigor mortis look of concentration, it doesn't work." 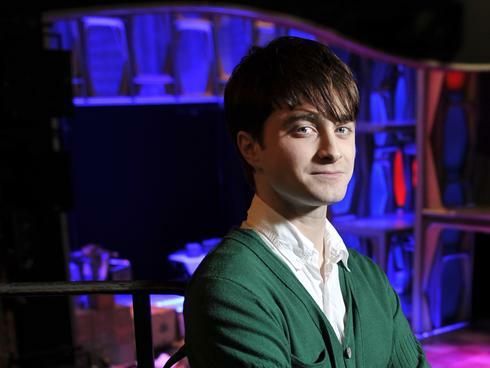 "To just do a show for six weeks, that's not doing it properly," Radcliffe says. "I did Equus for five months, and by the end I was definitely ready to stop. But this show is so different, so much fun. I think it will be hard to stop enjoying it." "It was very sad, on the final day of filming [Harry Potter]," Radcliffe says. "But it had to end. To have me doing it at 30 would be awful. I think we can look back at the last 10 years with pride — not just in the films, but at what they achieved for the British film industry. At the moment it's doing fantastically, but there was a time in the early 2000s when we were the only big film shooting in Britain." "I've always thought that as long as directors and casting directors don't see me as just Harry Potter, I'll be OK," Radcliffe says. "People have shown a lot of faith in me, and I owe them a huge debt. They're letting me prove that I'm serious about this." 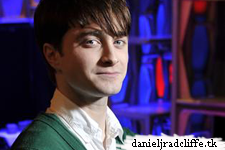 "I play a young lawyer who's asked to sort out the documents of a recently deceased woman," Radcliffe says of Black. "It's truly chilling, but it's not just a horror movie; it's a film about grief, and the different ways that people deal with it. Every character has been touched by death, but it should be beautiful as well as terrifying."